Converged Communication Systems is a nationwide telecommunication and data infrastructure consulting, business phone system sales, design, installation, service and maintenance support organization. CCS provides best-in-class solutions with fully managed support options while providing standard, extended, or 24/7 maintenance programs. CCS has certified Avaya, Nortel, and Cisco professionals on staff ready to assist you. Our data support group specializes in Linux, Windows, HP, Dell, Sonicwall, Cisco, Juniper, Extreme and many other manufacturers. Visit our main site http://www.convergedsystems.com. 1600 Series sets now available for IP Office and ACM. IP Dect R4 inexpensive additions for wireless. Integrate mobile phones with One-X connect. New 9670G H.323 SIP IP Phone & 9600 series available for ACM. Small businesses that need a stable telephone system with basic feature functionality turn to the Avaya Partner product line. The Partner heritage has evolved from AT&T to Lucent and now Avaya. Avaya ACS R1 to R6 was a 3 line by 8 extension processor, whereas the R7 and R8 are 5 lines by 9 extensions. This solution is typically for small businesses needing basic functionality and voicemail that can grow up to about 40 extensions. The Partner Series 1 or Eurostytle sets work on the Avaya Partner systems from Partner II, Partner Plus and Partner ACS. The MLS are Partners older series that also work on newer ACS processors however have some feature limitations (ie caller id log doesnt work). broadened the depth of the Polycom product line. Polycom also has VOIP, H.323, and SIP standard endpoints you can add to any PBX. Partner Series II are the latest on the Partner telephone set series and were redesigned. The Partner works on Partner or small business Avaya key systems. Some Partner set customers when they outgrew the Partner capacity reused the Partner sets on the Merlin Legend and Merlin Magix products with 016ETR cards. For information on ACS releases. Small businesses to medium sized businesses from 0-200 stations relied on the Merlin product line for over 15 years. From bis-10 handsets, to MLX digital phones, to 4400 series TDL, the Merlin line evolved over the years and was branded AT&T, Lucent and then Avaya. With the onset of the Avaya IP Office, Merlin customers have been migrating to this robust solutions and can reuse their 4400 sets. Audix, Octel, and Merlin Mail and Messaging. Our most popular telephone system option for both small and medium sized businesses is the IP Office. Pay as you grow architecture and feature rich options on a medium sized solution. Grow up to 384 endpoints per processor. This solution allows analog, digital, H.323 VOIP, and SIP endpoints or any combination. Free features like 64 conference bridge, built in call recording, high level ACD and queuing features and well as voicemail to email is extremely popular. If you are a current Merlin Magix with 4406, 4412, or 4424 or Definity 6400 series (6408, 6416, 6424) user feel free to reuse these endpoints. Enterprise businesses from 0-36,000 endpoints with a need for 5-9s of reliability have turned to the Definity family as the industry leading PBX on the market. If you have a CSI, MCC, SCC or any other cabinet the Definity is the most robust PBX on the market. Customer who have current Definity solutions can migrate their legacy processors to Avaya's latest media servers and / or gateways. Definity customers have 7400, 8400, 2500, 2400, 4600, 6800, 1600, and 9600 series telephone options in analog, digital, voip, or sip endpoints. Definity has the most robust call center ACD and queuing options on the market today as well as unified communication and contact center solutions. Formerly known as Definity and Multivantage, has solutions to fit any enterprise. 90% of fortune 500 companies have enterprise Avaya solutions in place today. Media Servers include S8100, S8300, S8400, S8500, S8510, S8700, S8710, S8720, S8730, S8800 and more. Media Gateway options include G150, G250, G350, G430, G450, IG550, G650, and G700. If you need to migrate your existing Definity you can reuse some circuit packs as well as handsets. Call Center options include Taske, Zeacom, BCMR, BCMS, CMS, CCE, and CIE. Voicemail options include Definity Audix, Objectworld, Intuity Audix, Intuity Audix LX, Map5, Map40, Map100, Octel, Aria, Modular Messaging and more. Add application servers such as AES (application enablement server), SES or Session Manager for SIP connectivity, One-X Portal, One-X Mobile, company applications and databases and any IVR solutions. The IP Office IP400 was the first inception of the IP Office product line. The IP400 came in IP403, IP406v1, IP406v2, IP412 and IP401 which is also called the IP SOHO. 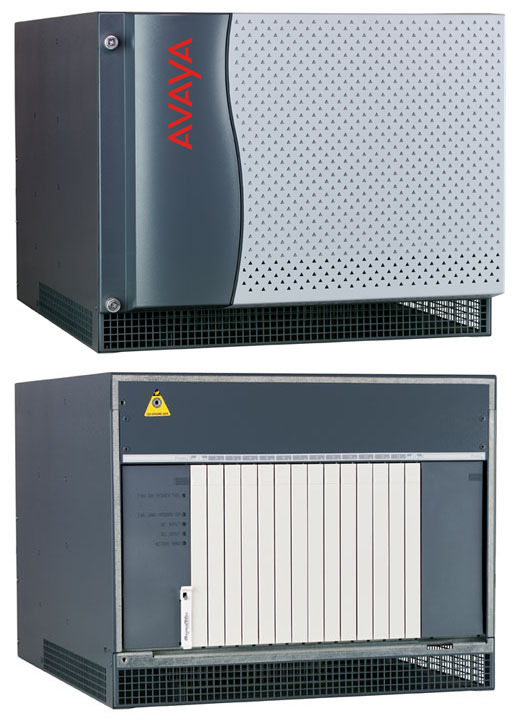 As of Nov 2009, Avaya has discontinued the sale of the IP400 processor and introduced the more flexible IP500 processor. However, customers in a IP400 can smoothly upgrade to the IP500 processor without replacing all their equipment. Currently, IP406v2 PCS8+ and IP412 customers can upgrade their software to R5.0, whereas the IP406v1 and IP403v1 can go up to R3.2.x and IPSOHO can go up to R4.x. If you are looking for support and maintenance or some additional programming assistance, contact the CCS support group. Eventhough the manufacturer may discontinue support on older versions, the Converged support group can maintain and support all older phone systems and legacy systems. The IP Office has robust feature set built in and let the CCS support group help you leverage them. The IP500 processor was introduce with IP Office R4.0. This processor has 4 insert module slots in the front for easy serving and adding things like T1, VCM, IP Resources, ATM, Trunks, POTS, digital and analog station ports. If you are a current IP400 customer, reuse your expansion modules and upgrade to R5.0. Contact a CCS sales and design specialist to review migration process and feature updates. In R5.0, the software entitlement is free - so upgrade now with Converged Communication Systems onsite or remote support services. With the release of ACM R5.2, the G430 media gateway was released to replace the G250 and G350 to fill the gap of a more scaleable more serviceable small gateway option. The G430 is ideal for organizations or remote locations that will not exceed about 100 endpoints. The initial chassis comes with 20 DSP or IP Resources built on and maxes out at 100 DSP total. You can have up to 3 total G430 units. The expansion units are called EM200. Each chassis has 3 media module slots. If you want to use this as a LSP or SLS, your main site needs to be at CM5.2+. 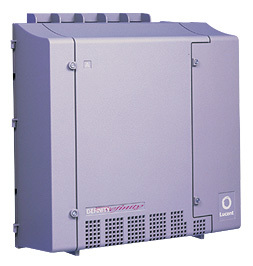 The G450 media gateway is the most common of the media gateways. This unit grows up to 450 endpoints. All boards and fans are removeable. Additional power options are available. Up to 240 IP resources or DSP resources are available per chassis. Up to 8 media module slots and either ICC, LSP, or SLS are available. Leverage a S8300C or S8300D media server processor or external S8500, S8510, or S8800. If this needs to act as a remote site, then main site needs to be CM5.0+. Standard or Enterprise edition software available with Call Center Basic, Introductory, and Elite packages available. Avaya Software Support SS and SSU plus upgrades available. Avaya just recently discontinued G250 and G350 with the release of G430 which is more scaleable. The G250 was used for remote offices or small offices that need enterprise features less than about 12 people. The G350 grew to about 72 people. If you have a current G250 or G350 and need programming and maintenance support, contact your local CCS support and design specialist. If you are looking to migrate or upgrade your remote H.248 gateways, CCS can help design and plan a phased migration strategy for your locations. If you are a current Definity BCS, ECS, Prologix, CSI, CMC, SCC, MCC or any Definity product customer, the Converged support group is here to help maintain your investment for years to come with our national support plans and proactive monitoring solutions. If you need parts for additions, the Converged team can help review all options. If you are looking to upgrade to an integrated IP solutions - the Converged support group can layout options whether leveraging S8100 or S8400 processor, moving all TN or circuit packs to new G650 gateway or mapping out a strategy for a forklift upgrade. If you have an older legacy voicemail like Octel, Intuity Audix, Definity Audix, Intuity Audix LX, Map 5, Map 40, or Map 100 - the Converged support group can design a Modular Messaging solution to help your business receive Avaya credits on current licensed users to move to a newer unified voicemail platform. Avaya's best in class IP telephony solutions presents Avaya 9600 series IP sets. Whether you need H.323, VOIP, or SIP, the 9600 series can be configured on demand. Leverage G.722 for high fidelity speakerphone. We have 9600 series sets for all your needs whether 9610, 9620, 9630, 9640, 9650, or 9670. If you need gigabit or color screen with touch screen, you came to the right place. Some of our 9600 sets have usb plugs to allow a simple usb plug in that will bring the users profile wherever they go. Also, you can select certain parties to mute on a conference call with easy to use digital screens. The 9600 are available on Avaya Communication Manager and word has it that Avaya might allow 9600 solutions on IP Office R6.0 - more to come. Avaya's economical IP deskphone, the 1600 series, is available on IP Office R4.1+ and Avaya Communication Manager. Avaya 1603, 1608, or 1616 with side console is an afforable way to roll out IP phones to common areas or to save money on overall telephone system. Avaya 2400 series are digital phones that you can add to your Communication Manager or IP Office. The 2400 comes in 2402, 2410 and 2420. The 5400 series are also digital and are practically identical to 2400 series, however 5400 series are only available on IP Office. 5402, 5410, 5420, and EU24 for side console are all available. The 4600 and 5600 series look identical to the 2400 and 5400 however they are IP phones version. The 5600 only works on the IP Office, whereas the 4600 works on both. 4621 and 5621 are backlit IP telephones whereas the 5610 and 4610 are most common IP phones. The 4620 and 5620 are more executive style and larger sets. For Enterprise customers over 450 endpoints or current larger Definity customers, the G650 media gateway is the gateway of choice. S8500 and S8700 media servers allow industry best uptime for your communication systems. Legacy TN boards or Definity circuit packs can be reused in this rack mountable cabinet. There are many configurations of this solution. Reuse older digital phones on this chassis with TN2224 boards. Contact CCS sales and design team for assistance. Avaya history rich Definity digital sets have evolved from 2 pair to single pair (4 wire to 2 wire) phones. For small Definity customers with 6408, 6416, and 6424 sets, you can keep your investment and migrate to Avaya IP Office. For larger Definity customers with 6400, 7400, and 8400 series digital sets you can look to reuse from equipment and sets and move to Avaya Communication Manager solutions. Avaya IP Dect, Dect R4, and Avaya Mobility, are wireless Avaya solutions you can add to your Avaya PBX. Avaya has both analog, digital and IP wireless and cordless options to integrate in your environment. IP Dect and DEctR4 are inexpensive wireless solutions that work on IPDect technology. Polycom wireless, formerly Spectralink wireless, are also available which work on existing wireless infrastructure. Thanks for reading Converged Communication Systems, LLC, Nortel, Cisco, Avaya and other respected manufacturers.